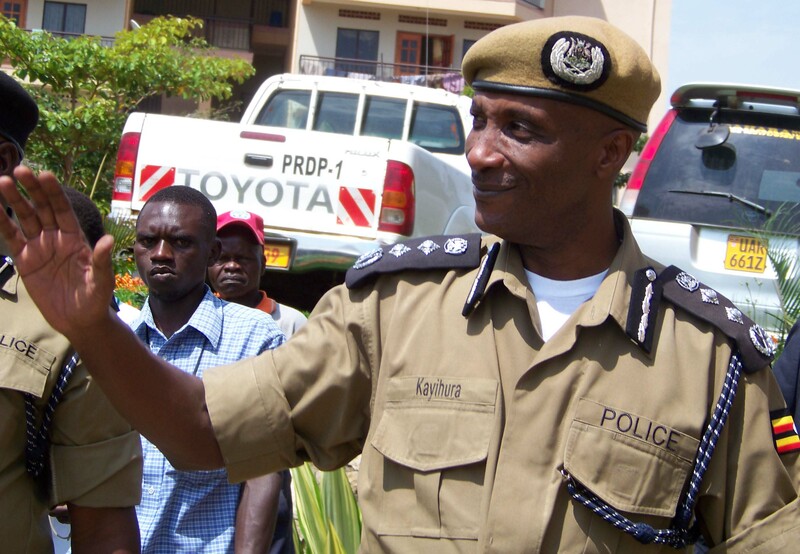 Under Kale Kayihura’s 13-year tenure, the police committed widespread and systematic abuses. Many would now like to see him prosecuted. Kale Kayihura had been Inspector General of Police since 2005 before he was dismissed earlier this month. Last week, Uganda experienced a senior changing of the guard as Kale Kayihura was officially replaced as Inspector General of Police. The prominent figure had been head of the Uganda Police Force for over 12 years, and his contract had been renewed for another three years less than a year ago. But in a surprising move earlier this month, he was abruptly dismissed by President Yoweri Museveni. Given his long-standing closeness to the president, Kayihura’s removal has raised several questions. Speculation as to why he was let go includes the former police chief’s rivalry with Minister of Security Henry Tumukunde, who was also sacked, and his questionable relationship with Rwandan operatives. Whatever the reasons, however, one thing that is clear is that Kayihura’s tenure was mired in controversy. As Uganda’s first Inspector General of Police after the restoration of multi-party politics in 2005, he became known as a brutal suppressor of the opposition and the head of a Force which became increasingly politicised. Although Kayihura improved the Uganda Police Force in terms of recruitment, training, and its budget allowance, other initiatives were less positive. A prime example is the “Crime Preventers” community policing programme, which led to pro-state vigilantism. Human rights organisations have condemned the group’s violence, extortion, and lack of regulation or accountability. Clearly aligned with the ruling National Resistance Movement, members of the Crime Preventers have intimidated opposition members and their supporters. The Kiboko Squad, notorious for their use of sticks to disperse protesters, are allegedly an offshoot of the Crime Preventers. They have certainly been linked to the police, and Museveni has openly praised them. Furthermore, Kayihura’s tenure has been characterised by widespread allegations of harassment, brutality and torture by police officers themselves. Between 2012 and 2016, the Ugandan Human Rights Commission received over 1,000 allegations of torture related to the police. The African Centre for Treatment and Rehabilitation of Torture Victims received almost double this in same period. Kayihura showed little willingness to address this problem. For instance, when the torture of suspects at Nalufenya police station, including that of the Mayor of Kamwenge, went viral in early-2017, the police chief failed to directly address the issue. According to the Centre for Constitutional Governance, opposition members and supporters have been the most common victims of police brutality in Uganda. Indeed, investigations by the likes of Amnesty International and Human Rights Watch found use of excessive police force to disperse opposition gatherings in the lead up to the 2006, 2011, and 2016 presidential elections as well as numerous unlawful arrests and torture. Likewise, demonstrations against the controversial age limit removal bill – which passed in December 2017 and allows Museveni to potentially hold power until 2034 – saw several instances of excessive force resulting in injuries and death. Even the Mayor of Kampala was arrested on suspicion that he was headed to protest the bill. Journalists were also targeted, not for the first time under Kayihura. In 2016 alone, the Human Rights Network of Journalists Uganda (HRNJ-U) reported 83 violations against reporters committed by the police. Journalists have been denied access to news scenes, had their gadgets damaged, been threatened or attacked, unfairly arrested and detained, and even abducted. These practices escalated under Kayihura’s tenure. The police attempted to justify brutality with reference to the Public Order Management Act, passed in 2013. Meanwhile, when officers were caught in the act of human rights abuses, Kayihura shifted the blame to the journalists covering it. HRNJ-U rightly called this intimidation. Over the years, there have been some attempts to bring Kayihura and his Police Force to justice. In July 2016, court summons were issued for criminal proceedings against the inspector general and seven other senior police officers. These regarded brutality and torture of supporters of opposition leader Kizza Besigye. Both governing and opposition MPs had condemned the police’s actions on this front, but Kayihura praised them and Museveni supported him throughout. The court hearing on the matter was due to be held in August 2016, but the accused never showed up and the case ended up being halted by the Deputy Chief Justice. Now, following Kayihura’s dismissal, fresh attempts at justice are underway. Most notably, an application has been filed with the International Criminal Court against Kayihura and 16 other senior officers for crimes against humanity. The charges relate to the forceful deportation of Rwandans between 2010 and 2017, with accusations including murder, torture, enforced disappearances, and forceful transfer of a population. It is alleged that police officers were offered $5,000 for each individual repatriated and that Rwandans who resisted were executed. In addition, HRNJ-U has stated its intention to take Kayihura to court for the persistent mistreatment and harassment of journalists under his tenure. These charges, if successful, would set an important precedent in fighting police abuses and impunity in Uganda. The takeover of the inspector general position by Martin Okoth Ochola further provides an opportunity for reform. The Crime Preventers’ future has already been marked for deliberation, with the police spokesperson announcing that Ochola may dissolve the initiative or pass a regulation policy. Ochala has also promised to clean up the police’s image and has been known for his discipline and calls against corruption. However, with Museveni set to continue his rule, the restrictive Public Order Management Act still in place, and the likelihood that brutality and impunity has become ingrained in the force, it is yet to be seen whether Ochala can bring significant change. But one thing can be certain – Kayihura has left a lasting, although infamous, legacy. Leighann Spencer is a PhD Candidate in Criminology, Charles Sturt University. Kayihura should be taken to the International court and face all the charges.